The mere-exposure effect refers to how a person’s preference for something (e.g. a song or person) rises due to how familiar they are with it. This means that the more often a person sees or experiences something the more positive their feelings are likely to be towards the object or person. The mere-exposure effect explains why we generally prefer songs or music that we have previously listened to and are less comfortable about listening to new songs. The mere-exposure effect is an important reason why advertising can have a positive influence on our propensity to purchase even if we are not consciously paying attention to it. Repeated exposure to an advert means that we are likely to become more familiar with the brand name or product. When we next come across the brand it will be more familiar to us and that familiarity makes us like it more than before we had been exposed to the ad. Why does familiarity make us like something more? One explanation for the mere-exposure effect is that our cognitive system associates familiarity with something being safe. When we experience something unpleasant we have a strong negative reaction to it and automatically try to avoid it the next time we encounter it. However, when you come across something that is not unpleasant the cognitive system considers that it must be safe. The two-factor theory suggests that the mere-exposure effect may be the result of improved cognitive fluency which is generated by experiencing something multiple times. This means our ability to process something improves with familiarity and perceptual fluency creates a more positive experience for a person. This has been found to put people in a more positive frame of mind compared to when we find something difficult as this can cause cognitive strain. For example websites with low contrast text have been found to damage conversion because they influence user attitudes and alter behaviour. Darker text with a high contrast background has been found to improve cognitive fluency and increase conversions. 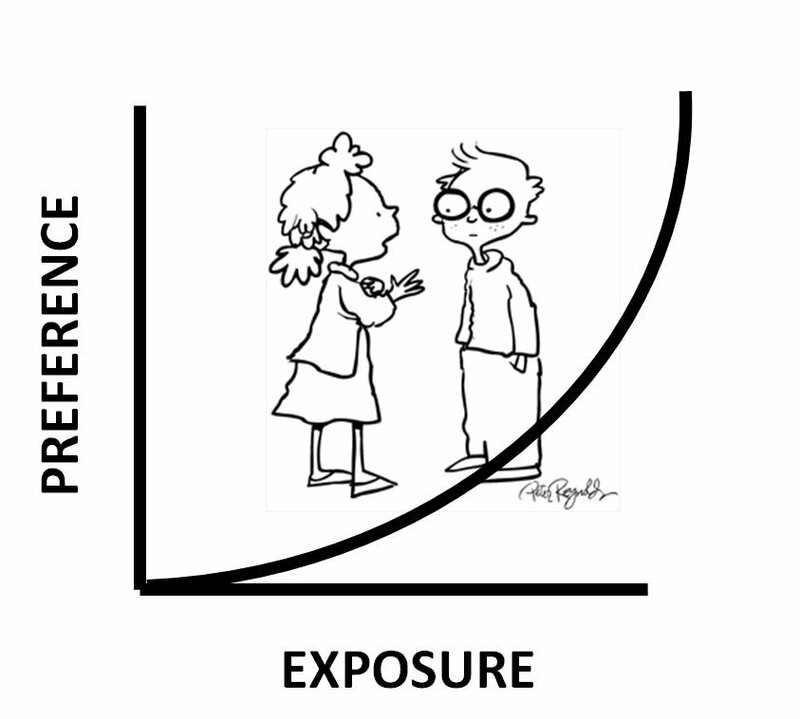 The mere-exposure effect is most strongly associated with experiments by Robert Zajonc in the 1960s. He showed that repeated exposure to a stimulus results in an attitude change. When participants were exposed to a familiar stimulus they rated them more positively compared to a stimulus that they had not encountered before. A review of studies by the psychologist Robert Bornstein (referred to as a meta-analysis) on Zajonc’s 1968 mere-exposure effect indicated that the effect is much greater if people are not consciously aware of the repetition of exposure. Bornstein argues that this is because when people are aware of repeated exposure they can discount the effects because they know what is going on. This suggests that things like product placement when done subtly should work well. A 2012 study concerning the European Song Contest found evidence of the mere-exposure effect influencing how viewers voted. The Eurovision is a two-stage competition in which some contestants will be more well-known to viewers than others. The research found that contestants received more votes if they had participated in a semi-final that was seen by voters. The mere-exposure effect demonstrates the value of a drip-feed approach to advertising and marketing communications using a consistent message to improve perceived fluency and familiarity with a brand. It confirms that repetition of a message or image improves liking and preferences for that content. However, this effect is more powerful when this repetition occurs outside of our conscious awareness. Repetition of a brand or message is an effective strategy because it improves perceptual fluency rather than because it increases brand recall. For conversion optimisation this confirms the importance of consistent branding and that your logo should be displayed on all user journeys, including on your registration form. It also a good reason to follow common web conventions as this makes navigating your site more familiar to new visitors. Another approach that benefits from the mere-exposure effect is to display popular merchandise or services on your landing pages so that visitors instantly see what is familiar to them. Avoid only showing new merchandise on your landing pages as this will not be familiar to visitors and can increase your bounce rate. However, don’t bombard visitors with messages or merchandise that you want them to become familiar with. Be subtle and keep to one message at a time as otherwise visual clutter can cause cognitive strain and undermine your whole strategy. Cognitive load – Minimising cognitive load to improve conversions.